The Bahá'í teachings prescribe daily prayer and intimate communion with God as the foundation for a life devoted to spiritual advancement and service to humanity. Prayers are offered individually or in devotional meetings, which are held throughout Dallas in homes small and large. The heart of a devotional meeting is the sharing of prayers and passages from Holy Scriptures, but beyond this there is no set form. 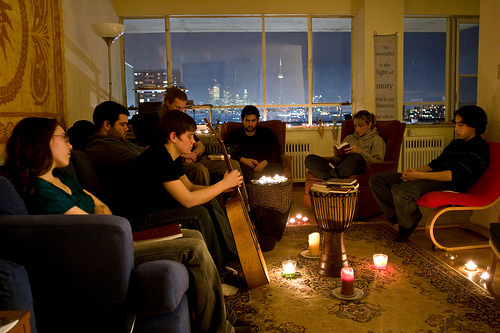 Devotional meetings are a chance for us to learn how to create an uplifting, spiritual atmosphere. This often involves music and the arts. The key is to help clear our minds from the anxieties of our daily lives and to meditate on our higher purpose. You are welcome to join a devotional meeting near you, and to simply sit, meditate and enjoy the atmosphere, or to play a more active role in hosting or organizing one.